The concluding section contains interviews with philosophers discussing their engagement with students and the wider public on issues and initiatives including experiential learning, civic and community engagement, disability rights and access, environmental degradation, professional diversity, social justice, and globalization. 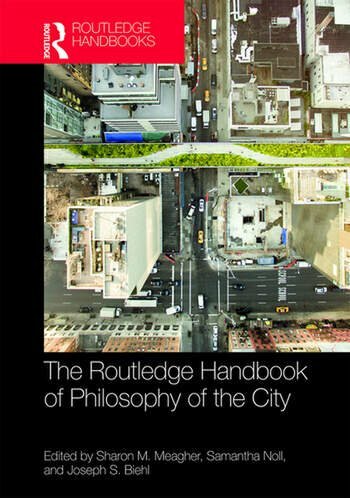 Essential reading for students and researchers in environmental philosophy, aesthetics and political philosophy, The Routledge Handbook of Philosophy of the City is also a useful resource for those in related fields, such as geography, urban studies, sociology, and political science. 40. Engaging Cities at Home and Abroad: Connecting our Students with Urban Communities: An interview with Sarah Donovan. Sharon M. Meagher is the Vice President for Academic Affairs, Dean of the Faculty, and Professor of Philosophy at Marymount Manhattan College, USA. Samantha Noll is an Assistant Professor in The School of Politics, Philosophy, and Public Affairs at Washington State University, USA, and a bioethicist with the Functional Genomics Initiative. Joseph S. Biehl is the founder and executive director of Gotham Philosophical Society, Inc., a federal 501(c)(3) non-profit organization dedicated to promoting philosophy in New York City.